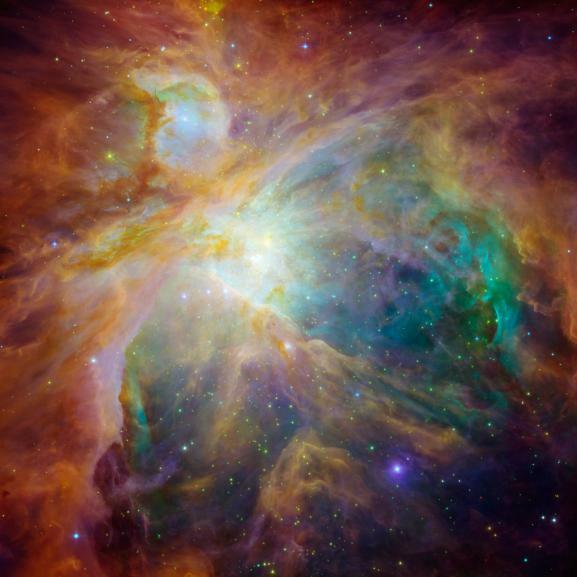 NASA’s Spitzer and Hubble Space Telescopes have teamed up to expose the chaos that baby stars are creating 1,500 light-years away in a cosmic cloud called the Orion nebula. This striking infrared and visible-light composite indicates that four monstrously massive stars at the center of the cloud may be the main culprits in the familiar Orion constellation. The stars are collectively called the “Trapezium.” Their community can be identified as the yellow smudge near the center of the image. Swirls of green in Hubble’s ultraviolet and visible-light view reveal hydrogen and sulfur gas that have been heated and ionized by intense ultraviolet radiation from the Trapezium’s stars. Meanwhile, Spitzer’s infrared view exposes carbon-rich molecules called polycyclic aromatic hydrocarbons in the cloud. These organic molecules have been illuminated by the Trapezium’s stars, and are shown in the composite as wisps of red and orange. On Earth, polycyclic aromatic hydrocarbons are found on burnt toast and in automobile exhaust. Together, the telescopes expose the stars in Orion as a rainbow of dots sprinkled throughout the image. Orange-yellow dots revealed by Spitzer are actually infant stars deeply embedded in a cocoon of dust and gas. Hubble showed less embedded stars as specks of green, and foreground stars as blue spots. Stellar winds from clusters of newborn stars scattered throughout the cloud etched all of the well-defined ridges and cavities in Orion. The large cavity near the right of the image was most likely carved by winds from the Trapezium’s stars. Located 1,500 light-years away from Earth, the Orion nebula is the brightest spot in the sword of the Orion, or the “Hunter” constellation. The cosmic cloud is also our closest massive star-formation factory, and astronomers believe it contains more than 1,000 young stars. The Orion constellation is a familiar sight in the fall and winter night sky in the northern hemisphere. 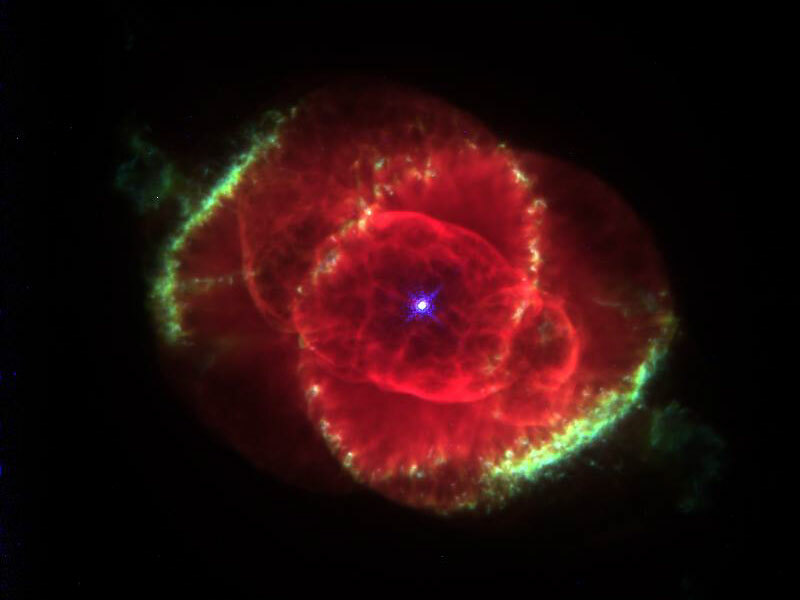 The nebula is invisible to the unaided eye, but can be resolved with binoculars or small telescopes. This image is a false-color composite where light detected at wavelengths of 0.43, 0.50, and 0.53 microns is blue. Light at wavelengths of 0.6, 0.65, and 0.91 microns is green. Light at 3.6 microns is orange, and 8.0 microns is red. Three thousand light-years away, a dying star throws off shells of glowing gas. 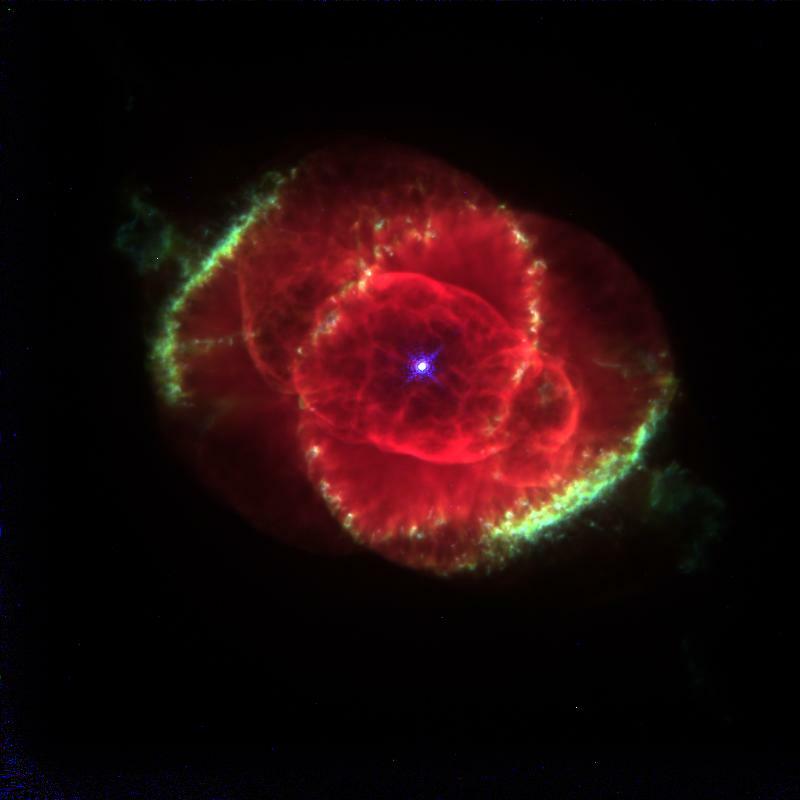 This image from the Hubble Space Telescope reveals the Cat’s Eye Nebula to be one of the most complex planetary nebulae known. In fact, the features seen in the Cat’s Eye are so complex that astronomers suspect the bright central object may actually be a binary star system. The term planetary nebula, used to describe this general class of objects, is misleading. Although these objects may appear round and planet-like in small telescopes, high resolution images reveal them to be stars surrounded by cocoons of gas blown off in the late stages of stellar evolution. 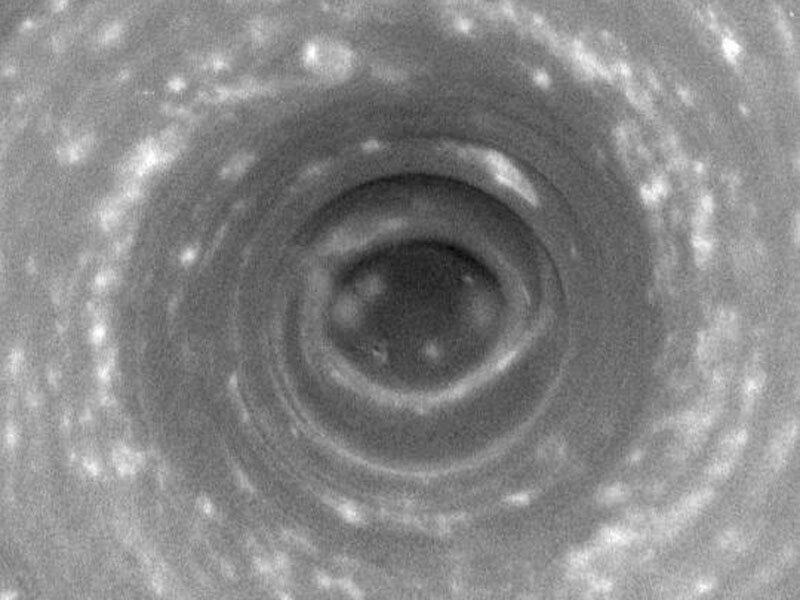 What’s happening at the south pole of Saturn? To find out, scientists sent the robot Cassini probe now orbiting Saturn directly over the lower spin axis of the ringed giant. Cassini found there a spectacular massive swirling storm system with a well developed eye-wall, similar to a hurricane here on Earth. One image of the storm is shown above, while several frames from the overpass have been made into a movie that shows the huge vortex rotating. The storm is slightly larger than the entire Earth and carries winds that reach 550 kilometers per hour, twice the velocity of a Category 5 hurricane. 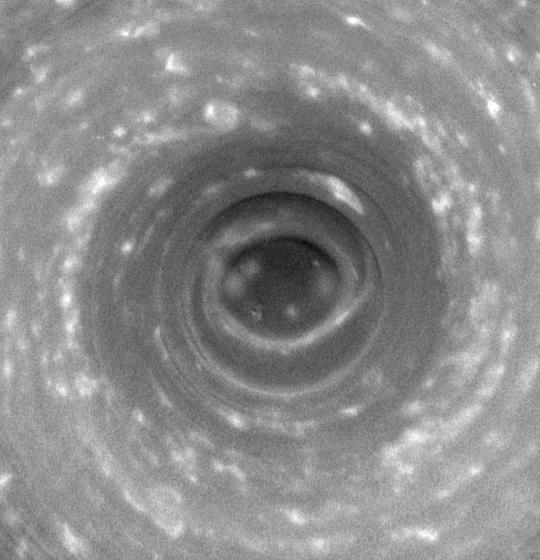 This pole vortex on Saturn might have been raging for billions of years and is not expected to drift off the pole. Follow the handle of the Big Dipper away from the dipper’s bowl, until you get to the handle’s last bright star. 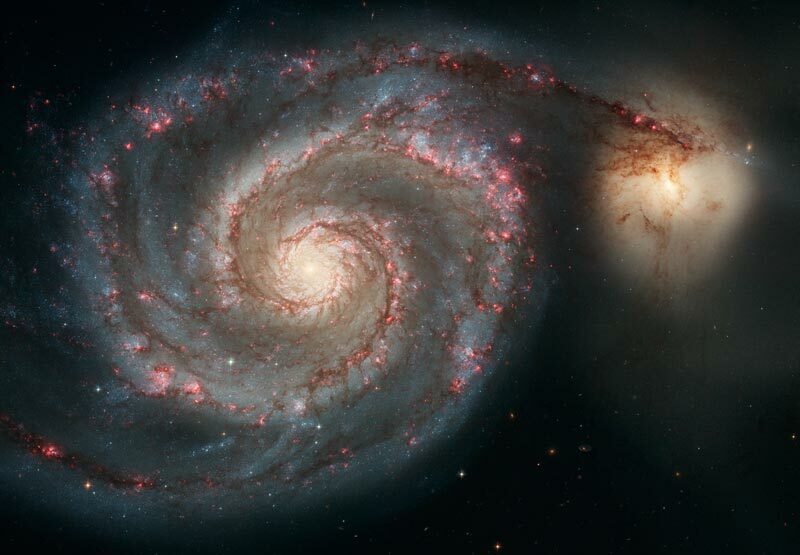 Then, just slide your telescope a little south and west and you might find this stunning pair of interacting galaxies, the 51st entry in Charles Messier’s famous catalog. Perhaps the original spiral nebula, the large galaxy with well defined spiral structure is also cataloged as NGC 5194. Its spiral arms and dust lanes clearly sweep in front of its companion galaxy (right), NGC 5195. The pair are about 31 million light-years distant and officially lie within the boundaries of the small constellation Canes Venatici. Though M51 looks faint and fuzzy in small, earthbound telescopes, this sharpest ever picture of M51 was made in January 2005 with the Advanced Camera for Surveys on board the Hubble Space Telescope.